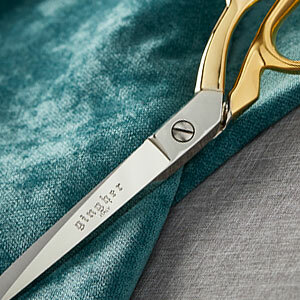 Dressmaker Shears offer a longer cut ideal for cutting patterns, trimming seams or cutting long swaths of fabric. 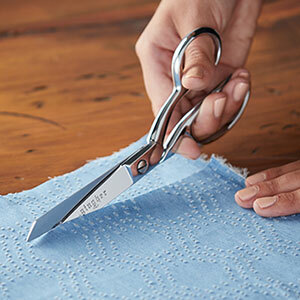 These versatile shears feature long, precision-ground, knife-edge blades that cut multiple layers of fabric easily, all the way to the tip. A double-plated chrome-over-nickel blade finish is both striking and durable, and the bent-handle design helps hold fabric flat on a tabletop or counter for smooth, comfortable, mistake-free cutting. Dressmaker Shears also include a nylon sheath to protect the blades when not in use. Timeless, Artisanal Quality Since 1947. Expertly crafted from premium, forged steel for effortless, precise cutting. Ultra-sharp, precision-ground, knife-edge blades cut all the way to the tip, gliding easily through multiple layers of fabric. The bent handle holds fabric flat for smooth, accurate cuts. 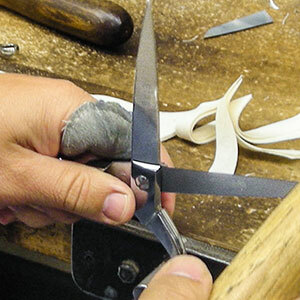 Gingher offers convenient sharpening and repair services for a fee on all our scissors. Items sent in will be restored to their original functional condition within 3-4 weeks.